None of Glu Mobile's celebrity games since Kim Kardashian: Hollywood have fared anywhere near as well as that breakout hit. And the recently-launched Britney Spears: American Dream, despite being arguably Glu's best celebrity game yet, looks unlikely to change that. Britney Spears: American Dream racked up 110,000 downloads after only a few days, SurveyMonkey reports. That's a decent start, but less than a quarter of the 460,000 Kendall & Kylie achieved in a similar timeframe. 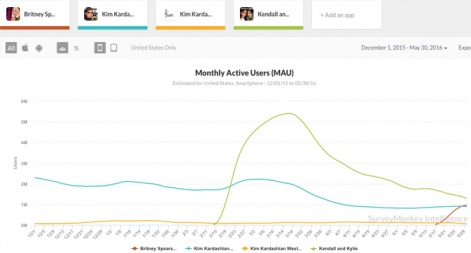 More broadly, Glu's celebrity games seem to struggle to retain Monthly Active Users. 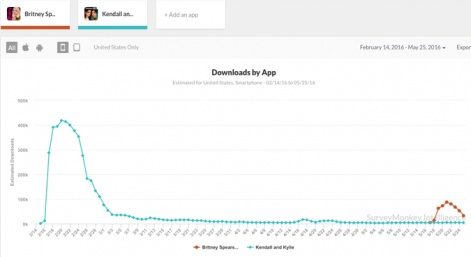 Kendall & Kylie currently has 1 million MAUs, but SurveyMonkey predicts that a rapidly churning player base will result in this number soon falling below the 800,000 still boasted by Kim Kardashian: Hollywood - a game two years its senior. Retention has clearly been an issue since Kim Kardashian: Hollywood and, with Britney Spears: American Dream starting from a lower base of players, the outlook isn't promising. Revenue is another area in which Glu's celebrity games have historically suffered sharp and quick declines. PocketGamer.biz noted back in May that Kendall & Kylie was already being out-grossed by Kim Kardashian: Hollywood. And indeed, Britney Spears: American Dream's revenue is already on the slide. So, with Kim Kardashian: Hollywood remaining the high watermark, will Glu Mobile ever manage to replicate that success? On current evidence, it's a tough ask. You can read the full SurveyMonkey report here. 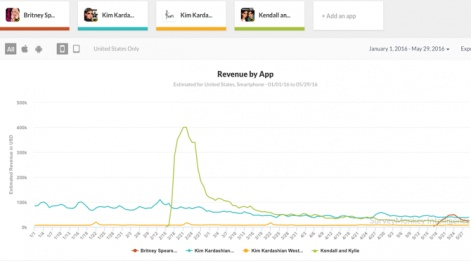 One year and $120 million later, is Kim Kardashian: Hollywood still top grossing?